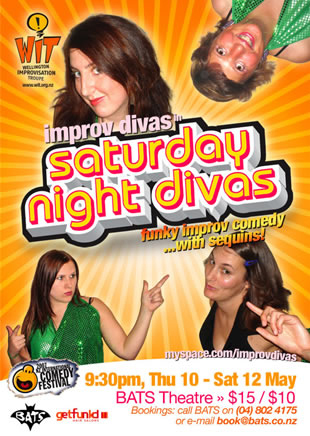 The foxy ladies of improv comedy are back in “Saturday Night Divas” – three funkadelic nights of stories, songs and scenes made up on the spot. As part of the New Zealand International Comedy Festival, BATS Theatre will play host to the Improv Divas as they shed their daggy daytime cardigans and reveal the dazzling divas within. Saturday Night Divas is another initiative from New Zealand’s first all-female improv act, the Improv Divas, the people responsible for the successful ‘LovePossibly’ in the 2005 Comedy Festival, in association with the Wellington Improvisation Troupe (WIT). WIT previously won the Best Comedy Award (New Zealand Fringe Festival 2003) and is Wellington’s only community-based improvisation troupe. So what are you waiting for? 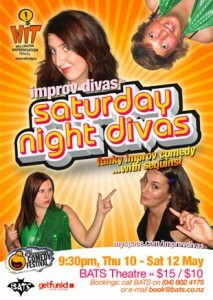 Get your groove on at BATS Theatre and see the Improv Divas in action! Can you dig it? This entry was posted in Improv Divas, past shows and tagged Divas, improv, improvisation on May 10, 2007 by MaDmin.